It&apos;s fig season in Sonoma Wine Country. To be honest, it&apos;s always fig season in Sonoma Valley, as we are blessed to have both excellent farmers and world-class chefs and food producers who know how to preserve fresh figs into all manner of jams, chutneys and dressings. Fresh figs: the Friday Farmers market (full name: Sonoma Valley Certified Farmers Market) is the spot to find all manners of fruits, veggies and figs when in season. The market is year-round on Friday mornings from 9 am to 12:30 pm and is an easy walk from the Sonoma Plaza. Foodie figs: of course a restaurant named girl and the fig would most likely have one of two items on the menu, and fig lovers will not be disappointed. Find figs used in appetizers, mains, desserts and even a cocktail or two at the restaurant that&apos;s been an institution along the Sonoma Plaza for more than two decades. But the fig love doesn&apos;t end there - the fig world expands to the fig cafe in Glen Ellen, a fig rig food truck and an online store. Visit: the girl and the fig, 110 West Spain Street, Sonoma, CA, www.thegirlandthefig.com, 707-938-3634 x10. Figs to go: If you are in town when fresh figs aren&apos;t falling off the trees, you can still get fig sauces, jellies and more at shops in Sonoma. In a hurry? Stop by the Sonoma Valley Visitors Bureau office in the historic Sonoma Plaza and grab a jar of some fig goodness for the perfect gift or a sweet memory of your visit to Sonoma Fig Country. 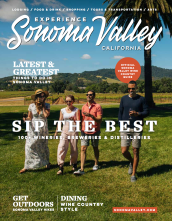 You can also get a map and some ideas on where to visit during the rest of your Sonoma vacation. Details: Sonoma Valley Visitors Bureau, 453 First Street East, Sonoma CA 95476, www.sonomavalley.com, 707-996-1090.